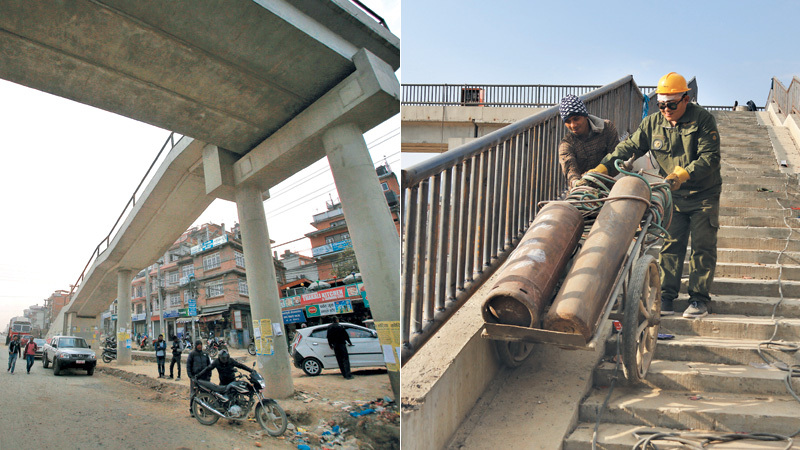 An overhead bridge at Koteshwor and a pedestrian bridge at Dhobighat have been completed in the first phase of the Kathmandu Ring Road Improvement Project (KRRIP). Out of the total six new bridges that the project had planned to complete by July 2018, construction work is yet to start on overhead bridges at Gwarko and Bagdol and pedestrian bridges at Satdobabto and Sanepa. Blacktopping of the 5-km stretch between Koteshwor and Ekantakuna is expected to be completed before monsoon in 2017, according to the KRRP. Forty-eight percent of the project works, including opening of tracks, wall constructions, drainage and sub-grade constructions, said Ganesh Jha, director of the KRRIP at the Department of Roads. According to Jha, half the estimated budget has already been utilised for the project being executed under the Chinese assistance at an outlay of Rs 5.13 billion. “The construction materials required for the project have already been procured,” said Jha. The construction work of 800-metre underpass between Khasibazaaar and Bafal Chowk had started in December 2016. After the removal of overhead bridge at Kalanki, the work on pile foundations for a four-lane underpass is going on. Out of the 400 pillars each 35 metres in height planned for the underpass, 65 pillars have already been built. The rest of the works are expected to be completed by 2018, according to the constructors. “Works are going on a war footing. A worker is appointed for nine hours every day to finish the work in time,” said Chenga Sherpa, field supervisor of Kalanki unit under the Chinese contractor Sanghai Construction Group. The Department of Roads and the Shanghai Construction Group had reached an agreement in December 2012 to expand the 10-km stretch between Koteshwor and Kalanki along the Ring Road. Under the deal the existing two-lane road will be widened to eight along with bicycle lane, footpath on either side and green belts. The project, launched in June 2013, was expected to be completed in 2017. But the completion date was pushed forward by a year to July 2018 due to the shortage of construction materials at first, then by the devastating earthquakes of 2015 and the fuel crisis in the wake of the Indian trade embargo the same year. The Chinese contractor resumed the works on the project in January 2016, after a nine-month pause. Works on the 17-km Kalanki-Chabahil-Koteshwor stretch in the second phase are expected to start after the completion of the Koteshwor-Kalanki section. The second phase of expansion works are expected to take 10 years to complete.